Archive for the ‘Economics’ Category. Where is Eugene’s Economy Heading? At first glance, this result (from the same survey) might appear to contradict http://lindholmcompanyblog.com/?p=9815. However, this is direction and the last is speed. What’s clear is that Eugeneans don’t think they are out of the proverbial woods yet. 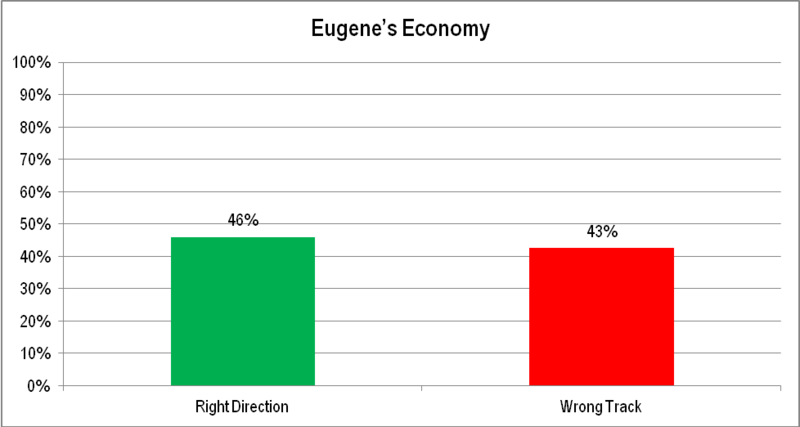 QUESTION: In general, do you feel Eugene’s economy is heading in the right direction or do you think things have gotten off on the wrong track? Category: Economics, Eugene and Lane County, Political | Comments Off on Where is Eugene’s Economy Heading? 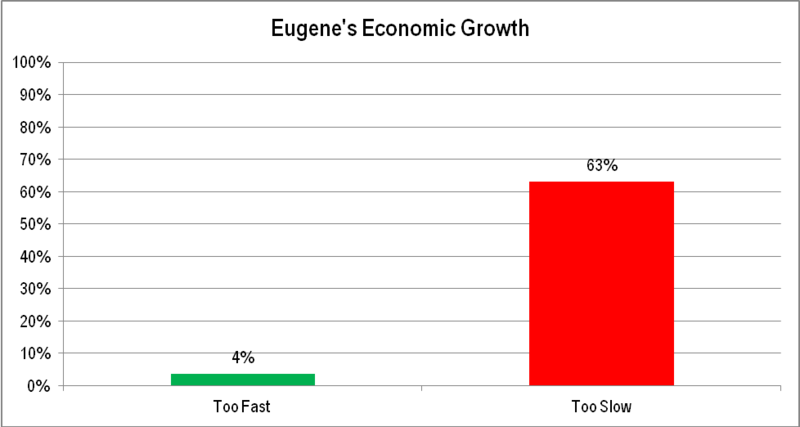 Is Eugene’s Economic Growth Fast Enough? It’s pretty clear, Eugene’s economy is not growing fast enough. QUESTION: Do you believe that recent economic growth in Eugene has been too fast, too slow, or just about right? Category: Economics, Eugene and Lane County, Political | Comments Off on Is Eugene’s Economic Growth Fast Enough? The red line shows the share of income held by each centile (1%) of population. A perfectly egalitarian distribution would follow the 45 degree blue line from the lower left corner to the upper right corner. Any real world distibution would fall short. The question is how much. The Gini coefficient measures the amount of area between perfect equality (the 45 degree blue line) and the actual distribution of income along the red line. The Gini coefficient for the State of Oregon in 2008 equalled 0.45. The Other Oregon, as defined here, includes everything except Clackamas, Multnomah, and Washington counties. Source of data: 2008 American Community Survey, Public Use Micro Sample. The Gini coefficient for the Portland Metro Area in 2008 equalled 0.45. The Portland Metro, as defined here, includes Clackamas, Multnomah, and Washington counties. This graphic show four different definitions of the size of the Lane County, Oregon agricultural sector. Roughly half the sector is in the Metro (Eugene and Springfield) ZIP Codes. The regions are defined by ZIP Code. The Metro region includes 97401, 97402, 97403, 97404, 97405, 97408, 97477 and 97478. The Rural region includes the rest of Lane County. The data are from 2008, the latest year available. Source of data: Minnesota Implan Group. This shows the relative size of the Lane County economy by region using employment and output as measures. The economic focus of Lane County is clearly in Eugene. The regions are defined by ZIP Code. The Eugene region includes 97401, 97402, 97403, 97404, 97405, and 97408. The Springfield region included 97477 and 97478. The Non-Metro region includes the rest of Lane County. The data are from 2008, the latest year available. The data include both private and government employment and output. The service sector is by far the largest sector. This is true in nearly every region of the United States. Compared with Eugene and Springfield, the rural region has more agriculture, construction, and government and a substantially smaller service sector. The latest official data are from 2008. The Rural Lane region includes all of Lane County outside the Eugene and Springfield regions (ZIP Codes: 97401, 97402, 97403, 97404, 97405, 97408, 97477, and 97478. The service sector is by far the largest sector. This is true in nearly every region of the United States. Compared with the county as a whole, Springfield has more construction and government. The Springfield region is defined by ZIP Code and includes: 97477 and 97478.